This week the HallPass team sat down with Former NBA Summer League Standout BJ Domingo. 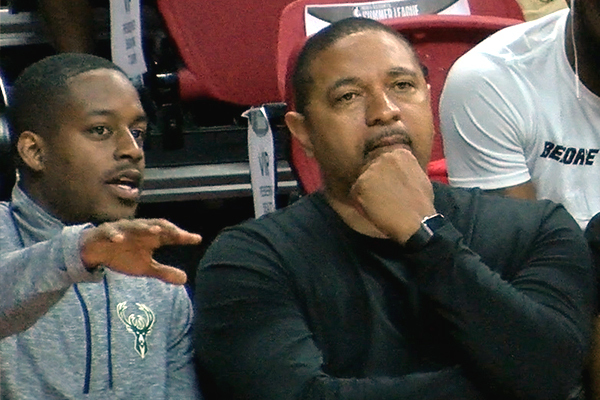 In this interview BJ talks about his current role as a Scout with the Milwaukee Bucks and his passion for basketball. Q: You have been a part of the NBA Summer League for 5 years. Tell us about your experience as part of the staff. It was my introduction to basketball at the highest level. At Summer League I was part of the Game Ops Crew, my role was to play music in-between quarters, games and during time outs to keep the crowd engaged. I loved it, because in addition to getting a front row seat to the games each day, I was able to build relationships with my coworkers that will last a lifetime. Q: What have you learned over the years while working at Summer League? I learned my ego is not my amigo, how to really work hard, I learned about some of the details that go into putting on a major event, and the pace and tone for Summer League starts at the top and works it way down. The example of hard work and attention to detail that Warren and Albert set is something special. Q: You now have a job with the Milwaukee Bucks, what is your title and what are your day-to-day responsibilities? I am a Scout for the Milwaukee Bucks. My day consists of evaluating film to find the best talent from High School, College, International Competition, and the NBA. I also write reports on the games I attend about, which players I think could fit the style of basketball the Milwaukee Bucks play. Q: What is your favorite / most rewarding part of your job? I love being able to watch the best talent around the world in places I haven’t been or otherwise wouldn’t go to. I also enjoy being able to visit my friends and family that live across the country. 5 years from now I see myself as a real decision-maker for an NBA team and hope to be the Head of a Scouting Department, Assistant General Manager, or General Manager. Q: Your job is one that many young people dream of having- what advice would you give a young person trying to break into the business? Take the time to look for any opportunities in the industry. Whether it’s volunteering at camps, student managing, working concession stands, or passing out flyers outside the arena. You never know who is watching or when/where you will break into the business of basketball. When the opportunities do start to come, be patient. It takes time to move up in a professional organization. Role models / People you admire? Any daily habits, rituals or routines? I like to start my day by working out, watching film, or reading. Love watching movies and TV Shows.